So you thought you were being all responsible by running updates on your WordPress site. And you were! Because running updates is an essential part of having a WordPress website. 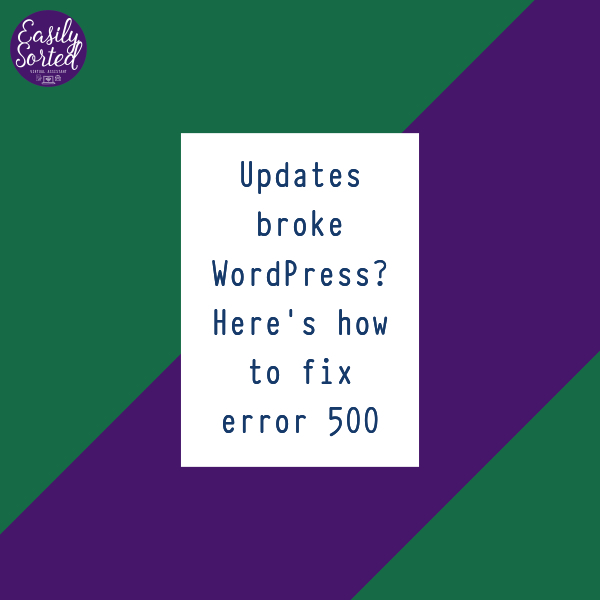 But then, you loaded a page on your site – maybe a new blog post you’re working on that you’d like to preview before publishing – and you get the dreaded error 500: internal server error. Error 500 is described as a misconfiguration of something on the web server. If you have access to error logs on your web host, you can find out more information about what exactly caused the error. But in case you don’t have that access, or don’t understand what the errors mean, guess what? I know how to help you. Why? Because I just had to fix my own site when my updates broke WordPress! The first thing you need to take note of is, what were you trying to load when the error happened? Were you looking at a published page/post on your site, or trying to get into the back end? If you can still get into the back end of your website, this is GOOD NEWS! It means you can get in and try to fix things without having to remember your cPanel password. If you can get into the back end, first go to the Plugins area and deactivate everything. Yes – everything. Don’t panic! You won’t be leaving your site like this permanently. And you won’t lose any settings for the plugins you’ve deactivated. Then, go try to load your home page. If it loads just fine, congratulations! You’ve found what the problem is: a dodgy plugin update. Next you’ll have to work out which plugin’s updates broke WordPress. To do this, you’ll re-activate one plugin at a time, then reload your home page again to see if everything works. When you get the error 500 again, stop. Go back and deactivate the plugin you just activated, and make a note of it. That plugin isn’t playing nicely with the rest of your website. Go through the rest of your plugins the same way, just in case there’s another one that’s playing up. But what if I can’t get into the back end? Ah, this is where it gets a little more involved, but still totally doable if you can get into cPanel – even if you’re not that technically inclined. Login to cPanel. Sometimes you need to login to your web host’s general account page first, then click a link to cPanel. Once you’re in cPanel, find the file manager icon and click on it. If it pops up a menu, just hit ok or submit to proceed. You’re in the file manager? Great! Now, find your WordPress directory. You might need to do a bit of exploring for this, depending on how your site was set up. Don’t worry – you won’t break anything just by looking through the folders. When you find where WordPress resides on your host – you’ll know by all the files called wp-(whatever).php – go into the wp-content directory. There, you’ll see folders for themes, media/images, and plugins. Now, right-click on the plugins folder. You’ll get a little pop-up menu. Find the option to rename, and click on that. Yes, you’ll be renaming your plugins folder. No, you won’t break anything worse than it already is! Rename the folder to something like plugins-old or plugins.bak. Keep that tab or window open for now. Then, go back to your website and try to load your home page, and login to the back end. Working? GREAT! Now, you can go back to the file manager and change the folder’s name back. Since you renamed the plugins folder, WordPress will behave as if you’ve removed it. Then, go into your website back end and get to the plugins area. Follow the instructions for re-activating plugins one by one. When you find one that breaks the website, go back to the file manager, rename that plugin’s folder, and go reload your website. And what if that doesn’t work? Give up in disgust. Please don’t do this! Take a break if you need to clear your head, but do come back to it. Google for answers. If you’re open to learning something new, this is a good option. There’s a lot of useful information out there. Ask your VA/tech person/web host to look at it. A decent web host – like Siteground – should sort these things out free of charge. See? If running your updates broke WordPress, it’s not the end of the world! It’s pretty easy to come back from it. Speaking of SiteGround – if you’ve been thinking about switching web hosts, there’s no time like the present. SiteGround are offering 70% off all annual shared hosting plans till 9 am Central European Time (that’s about 8 pm AEST). And in all my years of dealing with WordPress websites and web hosts, I gotta say SiteGround are my favourite host to work with. And I’m not just saying that because I’m an affiliate (so yes, if you use my link to sign up, I’ll earn a commission) – I’m an affiliate because they’re so awesome to work with. So go on, sign up! You know you want a host that delivers what it promises, that doesn’t leave you hanging, lose your data, or leave you open to hackers. And they’ll totally have your back when you find out that running updates broke WordPress. Is your to-do list so long you can't see the end of it? Enter your details here to get my FREE ebook, Overcoming Overwhelm - the best way to get things done without tearing your hair out.